If you ask people to choose just one word to describe what Christmas is all about, you’ll probably get one of the following:- children, family, love, giving, gifts, friends, parties and you don’t have to be a Christian to relate to any of those words ~~~~~~~ you just have to be a human being! These words apply all year round and to any celebration too. The one I choose is love because without it — nothing works and the world is not a nice place. The Bible says that God loved the Human Race so much that he sent his son to help us and I think that Christmas, the celebration of that son’s birth, is an ideal time for all of us, Christian or not, to spread around some love of our own. The old English word for love is charity. In England Christmastime is still known as The Season of Good Will. Boxing Day is so-called because on that day, the Charity Boxes in the Churches were opened and the contents given to the poor. 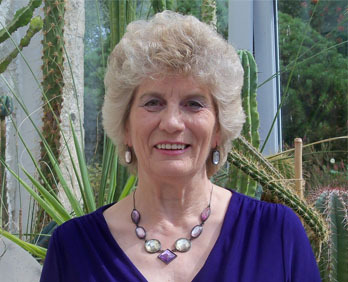 My favourite Charity is SPANA — The Society for the Protection of Animals Abroad. SPANA have a gift programme called “Happy Hooves” and when you have read the rest of my article I hope you will order some of their special unique gifts for your loved ones. For the rest of the info. and TO HELP BY MAKING A DONATION, please click here www.spana.org All currencies are welcomed. Why Do I Like SPANA? By looking after the welfare of these working animals, we aren’t simply teaching people “how to” fish — we are ensuring that they have the equipment needed “to” fish. Donate to SPANA Click Here! 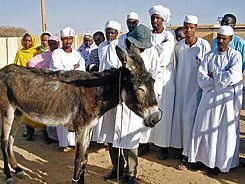 Founded in 1923 by two English ladies, Kate Hosali and her daughter Nina, who were horrified by what they saw as they travelled through North Africa, SPANA now has Clinics in major centres and mobile clinics which visit Souks and outlying areas to treat sick and injured animals. On a simple level the animals have colic or need worming, a good feed and rehydrating. ~~overgrown hooves because they don’t know how to pare them down or because they’ve made shoes out of rubber tyres thinking to cushion their donkey’s feet..
~~their attempts to treat sores in ways you and I would never think of in a thousand years! I found SPANA when I saw an advert asking for donations to provide proper bits. 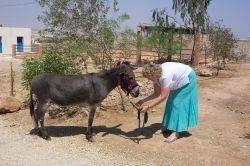 SPANA teaches local people to be farriers, Vets, First Aiders, teachers who go to the villages to teach owners how to care for animals properly, as well as people to run the Clinics and the Education Centres where children and adults come to learn all kinds of things. Educating owners in animal care. 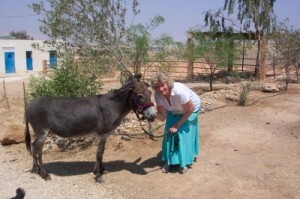 The donkey with me in the introduction is MY donkey, Sally. Her owners hobbled her every night with barbed wire and she was one of the animals “put up for adoption”. She was nursed back to health, her owners educated, and she went back to work. In the photo she is 20 years old and living in retirement in the Jordan Valley. 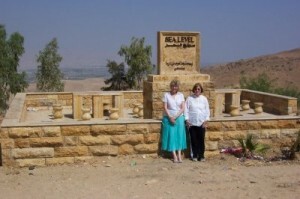 My friend,Mary lives in Jordan, and she and Chris Larter (SPANA) took me to see Sally in 2007 when I was there on holiday. Here we are at Sea Level. You can see the Jordan Valley is much lower. About 1100 feet lower and very hot. About 40 degrees C. (It was August). Sally is housed in that particular Clinic because she has spent most of her life down there and to bring her to where it’s cooler would not be good for her. 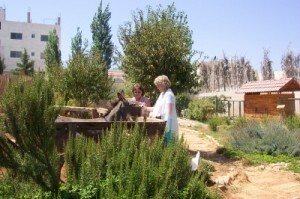 Two young donkeys at the Education Centre in Amman. This Centre is in the capital city of Jordan. There are classrooms, stables, and a garden which has “rooms” of plants from each of the landscapes and climates of Jordan, which range from desert to mountains. 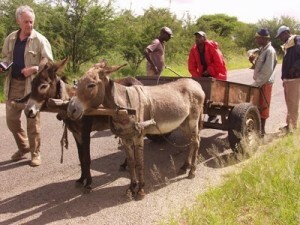 Besides learning how to care for the donkeys and other animals, the children are learning about the natural world at large and the critical importance of protecting and appreciating the environment. The Centre recently won a prestigious Green Apple Award from the Green Organisation, an independent non-profit group supported by the Environment Agency (a UK Government body) and the Chartered Institute of Environmental Health. “HAPPY HOOVES” GIFTS How does “Happy Hooves” work? Although SPANA has special gift “packages” at Christmas which you can buy as a gift for someone (they receive a card showing what you have bought in their name, eg. sterile dressings, medicines, “donuts”etc.) gifts are available all year round because the animals need help all year round. How does “Happy Hooves” work? Happy Hooves ~~ Lighten the Load. In the hustle and bustle of the Marrakech souks, animals like Mubarak carry their owners’ goods to market on carts. The strain is tremendous but Mubarak has no option but to carry on working in poorly made equipment, which can cause huge back and flank sores. 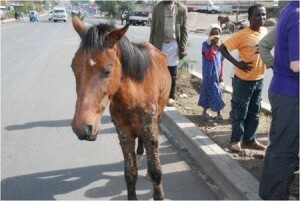 You can buy a padded harness for a working animal like Mubarak so he can work free from pain. Happy Hooves ~~ Ease the Ache.. Please leave me a note of your thoughts. and….if you enjoyed reading the above, please consider helping SPANA in their work.